Located in fashionable Jomtien just outside Pattaya the Sauna complex is on three floors.The Ground floor has a Steamroom a Sauna a Swimming Pool, Gymnasium, Jacuzzi a Bar and Restaurant serving professionally cooked and served Thai and Western Food, also a relaxing area with comfortable Sofas to watch the large TV, a Patio overlooking the area around the Swimming Pool where you can relax, have a drink and a snack. 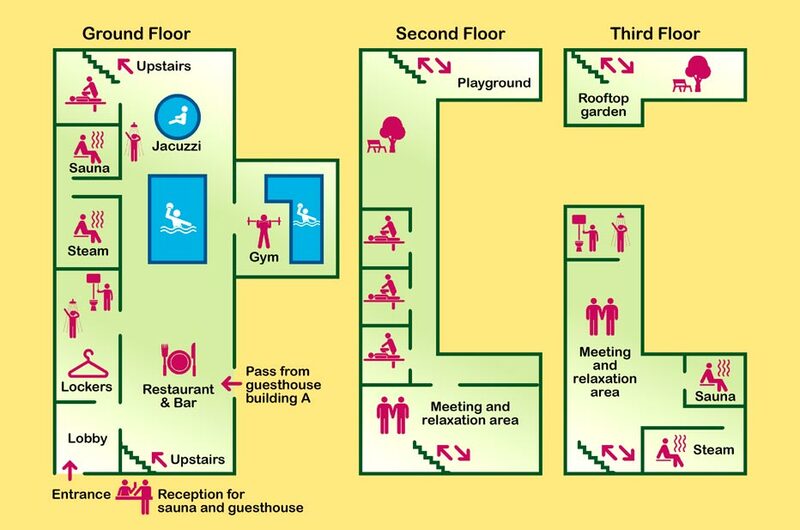 The Sauna opens at 14.00h, Closing time is usually about 23.00 depending on which day of the week and how busy the Sauna is. The entry price is 230 Baht. If you wish to use the swimming pool or Jacuzzi please bring swimming trunks with you. A 1 hour massage is 500 Baht, a 2 hour massage is 800 Baht. These prices do not include a tip for special services agreed between two consenting adults.